Creating under pressure can often be stressful. But I realize each year as we begin Cabin Fever, that attending for some is their get-away, a time for relaxing and allowing their inner artist (many are doctors, nurses, IT people with a lot of daily pressure) to come out to play and be massaged. We had an exciting first day of Cabin Fever Creative Arts Fest 2015 and the rooms were abuzz! And, goody bags overflowing – but it’s just the beginning. We have 6 more days of immersing ourselves into our art and absorbing what we can from the over-abundance of creative talent. Nan Roche, Marie Segal, and Eugena Topina were our first instructors up and they didn’t disappoint. Today, Nan and Marie come back for their collaborative workshop on Bauhaus design, the Mitchell sisters bring on their engineering and design expertise, Robert Dancik shows us how concrete is not just for sidewalks any more and Christi Friesen shares how to dramatically adorn ourselves. Tonight also begins the first of two nights of our newly added mini-workshops which are open to public registration. Maureen Carlson, Anke Humpert, and Mags Bonham join us for tonight. Cost is $35 and you can register onsite. Can not wait! 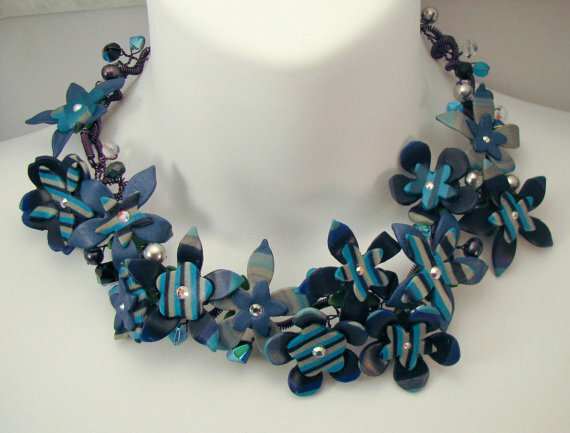 Anke Humpert is known all over Europe and her work is familiar to many polymer artists here in the US as well. 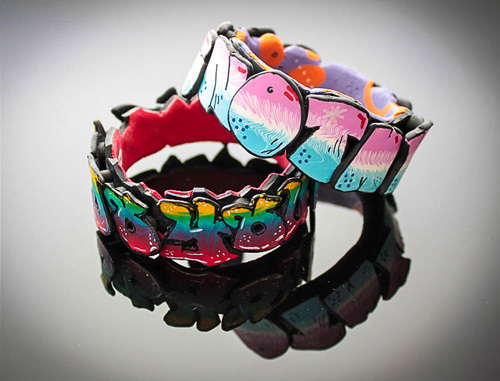 Her new styles are throwbacks to the 60’s and 70’s art with graffiti bangles at the forefront. Anke will be bringing the past to the present with her full day workshop. In addition, her translucent earrings workshop caught my eye as something surreal. We’ve also asked her to teach a 2-hour workshop on Friday night showing attendees her techniques on making your own texture stamps from polymer. While I’ve been doing this for a while, it looks fascinating with endless possibilities. Not too late to join the fun. Collaboration in many fields is the key to success. So it is in our world as well. This year, we have two collaborative teams to choose from. Ann and Karen Mitchell are the first and have been collaborating since they were children…they are sisters after all. Together, they created ANKARA Designs over two decades ago and their success lies in their ability to create new work. Their inspiration comes from all around them and they will be sharing their focus in two workshops at Cabin Fever next week. The first is their full-day workshop on Friday, 13 Feb., is about Engineering and Design in Jewelry Construction. 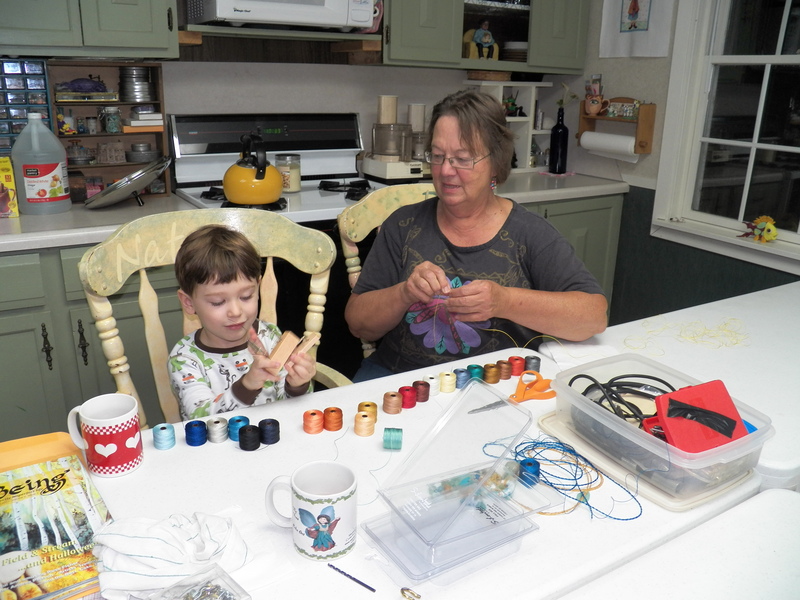 Together, they create each piece to be as unique as they are and they will share their tricks and tips with you on putting your components together into a spectacular piece. 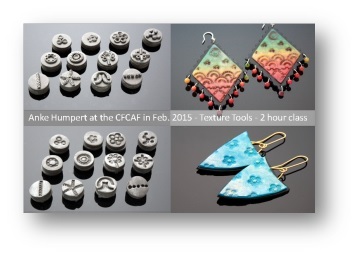 Their second offering is a 2-hour mini-workshop on Monday night, Feb. 16, from 7-9. 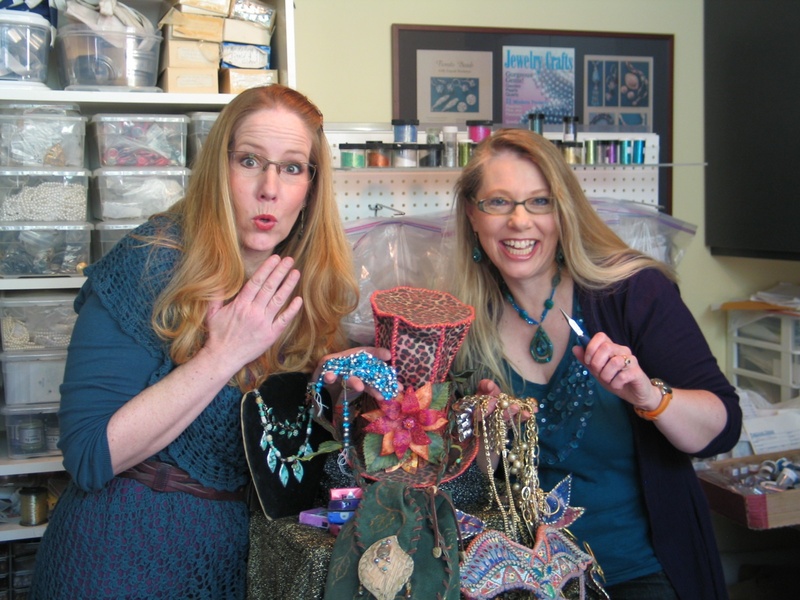 In this brief time, Ann and Karen will talk with you about ways to get out of that creative rut and find your unique style and inspiration. Both workshops still have availability. You can also register onsite for the 2-hour minis. The second collaborative team we’d like to look at is Nan Roche and Marie Segal. They’ve known each other for years, but it wasn’t until 2013 that they decided to collaborate on a teaching venture. It worked! 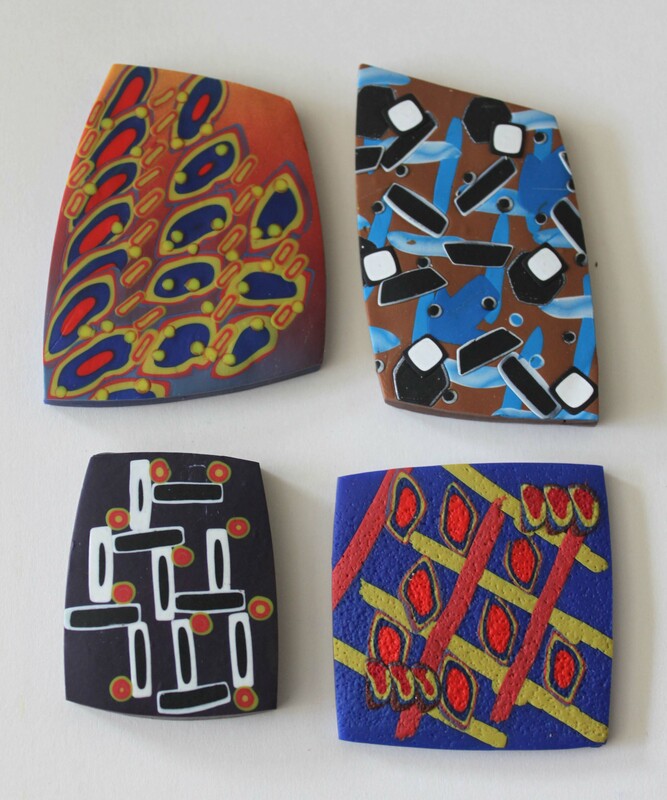 So they are back again in 2015 teaching their polymer take on Bauhaus design on Friday, 13 Feb. I can guarantee never a dull moment in this workshop and so many ways to apply the technique. Openings still available. WOW! Less than one week til Cabin Fever begins and I’ve got loads of work to get done still! If you been waiting, do it now. We’ve opened registration for day trippers and we’ve added some 2-our evening workshops for those unable to attend during the day. There is still time to join us and create your own immersion studies. Here’s a sneak peak at two of the evening workshops. Maureen has been working with polymer for decades and chances are, one of the first face or foot molds you used were one of her designs. If you’ve ever visited her studio, Maureen Carlson Center for Creative Arts in Jordan, MN, you’d see just how spirited she is – even down to the real faerie door in the tree by the creek! We are honored to present this year’s Creative Pioneer and Innovator Award to Maureen. She has blazed the trail for many of us and created inspiration all around. Her spirited work and thoughtful creative process has helped many focus on what’s important – just living. If you are interested in attending or would like to send a congratulatory note, please email Kathryn at cabinfeverclayfestival@yahoo.com or leave a comment below.